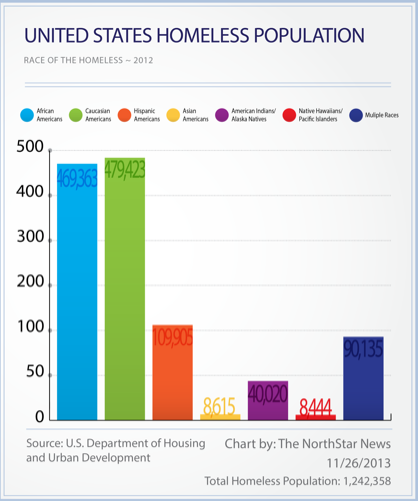 Blacks were nearly 40 percent of homeless population in 2012. The 101-page study by the U.S. Department of Housing Urban Development reported that more than 1.2 million homeless persons were living in emergency shelters, including 469, 363 African-Americans, who comprised 39.4 percent of the nation's homeless population from October 2011 to September 2012. This compares to 479,423 whites, 109,905 Hispanics, 8,615 Asians, 46,020 Native Americans, 8,444 native Hawaiians, and 90,135 persons of multiple races living in emergency shelters. HUD published the report in September 2013. “About 61 percent of the sheltered homeless population were in a minority group, comprised mostly of African-Americans,” HUD officials said. “Minorities, especially African-Americans, were overrepresented in the sheltered homeless population when compared to their share of the total U.S. population." HUD reported that people living in an emergency shelter were about 1.7 times more likely to be in a minority group than those in the total U.S. population and three times more likely to be African-American. African-Americans comprise 12.6 percent of the U.S. population, but in 2011, blacks were 38.2 percent of the homeless population and 38.6 percent of the homeless population in 2007. The study also reported that 293,475 African-American individuals were living in emergency shelters and 180,554 black families were living in emergency shelters. The above article, by Frederick H. Lowe, was originally published in the North Star News on November 26, 2013.